Yoshiko Kirby is an artist to watch. Over the last few years she has held several highly successful solo exhibitions, as well as having been involved in regional group displays. It seems to me that her ability to portray human emotions, especially those that come straight from the soul and tap into our universal sense of oneness, sets her apart from others. 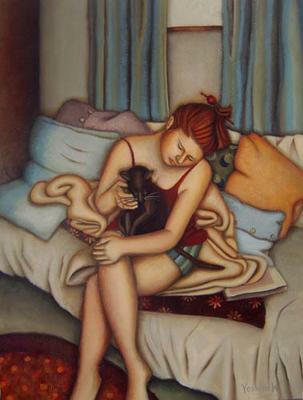 In the recent Cairns Art Society’s 66th annual exhibition she was awarded a Highly Commended certificate in the Open category for her oil painting, “Quiet Time With Cat”. 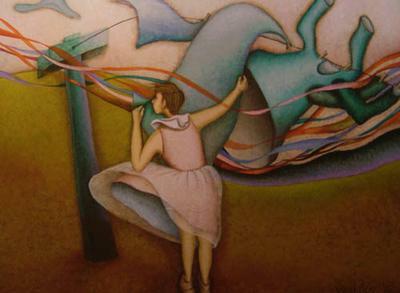 Yoshiko describes this painting as having a very personal background, which captured a moment in time. Following a period of stress in her life she noticed her daughter sitting with their cat, quietly stroking it. A feeling of empathy for her daughter, who also seemed like herself, draped with the comforting cat, overwhelmed her. Drained of all negative emotion, this was a quiet time, when healing could begin, thanks to the loyal and unconditional love that united them in peace. This recognition of Yoshiko’s work by judges follows a successful accolade from Cairns Art Society’s ‘Artists of the North’ exhibition in 2012 when she was chosen as # 1 of the top ten exhibiting artists with her painting, “A Piece Of The Puzzle”. This painting (see above) also tapped into Yoshiko’s connection with what we might call ‘universal consciousness’ or the unknown, whereby she is sometimes able to sense the future. A piece of a block, which is the future, fell and changed suddenly into a wind, which touched her cheek, making her so excited and happy. Following a period of uncertainty and sadness she once again felt a connection with her soul world, which she had thought to be lost. Yoshiko is to be congratulated for this recognition – and also for being true to herself by having the courage to share such personal revelations.